.Alan Joined Turnkey as the Program Director of Foreign Military Sales in October 2017. Upon leaving the military in 2006, Alan took up a role as head of security for a British company working in Eastern Europe. 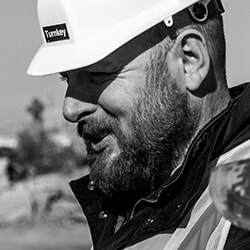 As head of security Alan was responsible for protecting high value assets and equipment as well as planning and developing infrastructure throughout the region such as workshops, offices, fuel infrastructure, accommodation and storage. In 2011 Alan joined Aegis Defence Services in Iraq as a project manager. Alan managed a large project in northern Iraq with a staff of over 300 multinational personnel who were responsible for a wide variety of security functions in support of the United States Government and Iraqi Air Force. For the last four years Alan has been managing a life support and security project in Baghdad, Iraq in support of the FMS program.